These St. Patrick’s day gloves feature a lovely puffy clover to help you celebrate the day. The pattern is given in one size, but can be adjusted by switching up your yarn and hook sizes. 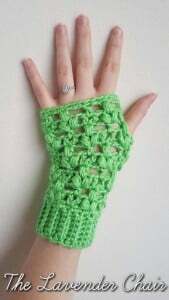 To make them for a small to medium size you will need a light worsted weight yarn and a 5.50mm crochet hook.